This free Super Bright LED Flashlight app for Androidis very popular already and only asks for permission to the camera and microphone. 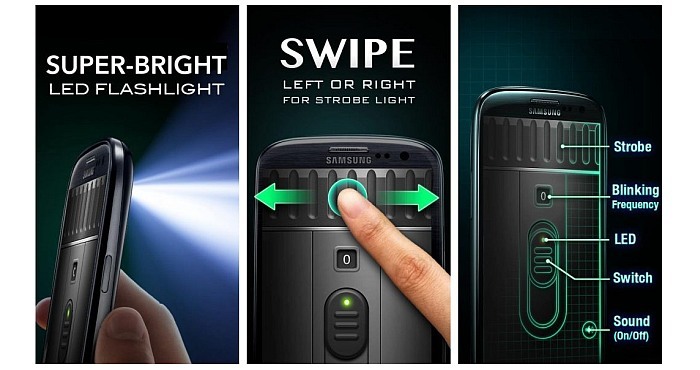 In addition to taking full advantage of your phone’s LED, it also comes with a strobe and blinking mode that is usually only found on tactical flashlight. The light is guaranteed to be powerful, much like using a torch light. The supported strobe and blinking modes give you the option to adjust the frequency. It also comes with a handy widget, for quick and easy access and features stunning graphics. The clean layout is fast to start, easy to use and offers you smooth operation overall.